What started as four reunion performances last October has extended into a year-long globetrotting tour for Neutral Milk Hotel, transforming the quartet into a well-oiled, ultra-focused live event, something the Southern indie rockers could have never laid claim to during their first incarnation. Visiting our nation's capital for the first time since their formation, Neutral Milk Hotel brought their reunion tour to Ottawa's thriving Folk Festival for a Saturday night performance. As day-long rains subsided just before showtime, festival-goers braved fields of mud and single-digit temperatures to greet the band with an outpour of adoration and appreciation. Consisting of all four original members, and joined onstage by multi-instrumentalist Jeremy Thal (of Bang on a Can) and a violinist, Neutral Milk Hotel opened their hour-plus set with the relatively obscure "I Will Bury You in Time," from their 2011 EP, Ferris Wheel on Fire, before launching into fan favourites "Holland, 1945," "The King of Carrot Flowers Pt. One" and its companion, "The King of Carrot Flowers Pts. Two & Three." As songwriter Jeff Mangum stayed to the left, centre stage was left open for Julian Koster's energetic and wide-eyed performance, which found the mufti-instrumentalist gleefully plugging away at his analog synth, banjo and singing saw. After running through a dozen tracks from their two studio albums, Mangum was left alone to perform the unreleased gem "Little Birds" before ending the show, joined by various live band members, for gorgeous renditions of In the Aeroplane Over the Sea's three final tracks, "Ghost," "(untitled)" and "Two-Headed Boy Pt. Two." Never mentioning their hiatus, while looking and sounding just as youthful as they did in the '90s, Neutral Milk Hotel left the frozen and absorbed Ottawa crowd with a performance that, much like their body of work, felt nothing short of timeless. ​Are Jeff Mangum's Latest Drawings Hinting at a New Neutral Milk Hotel Album? 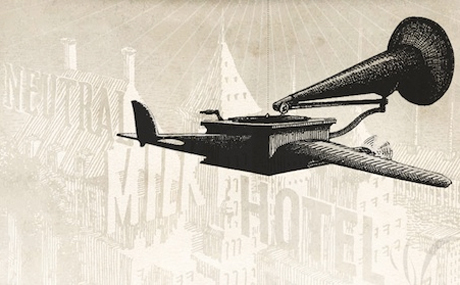 Neutral Milk Hotel Unveil "Last Tour for the Foreseeable Future"